Disclaimer: We were hosted at Revelry Vintners by Visit Walla Walla. We spent a long weekend in Walla Walla at the 2018 Winebloggers’s Conference. On the final night of that event, we attended a dinner with local winemakers. Jared Burns, winemaker and founder of Revelry Vintners brought himself and his wines to our table. We were very impressed with what we tasted. So, we were delighted that Revelry Vintners was one of the wineries on the post-conference excursion on the next day. Winemaker and owner Jared Burns. Jared Burns founded Revelry Vintners in 2005; barely two years after leaving college. During his college years at Whitman College, a liberal arts college in Walla Walla, he tasted and fell in love with a Merlot from Canoe Ridge. However, his connection to wine goes back much further. When he was nine years old his father, Dennis Burns, started a synthetic cork business, Supreme Corq. The tasting room, which opened in May of this year, is at the front of the production facility. Daylight pours in through the large windows. In addition, the high ceilings create a bright and airy space. The use of muted tones and clean lines create a room that is modern yet welcoming. The labels on the bottle, most of which are black and white, add to the refined feeling. There is nothing here to distract from the wines. Given how impressive a space has been created, it is little wonder that the building has won an award from the American Institute of Architects. One of the advantages of being in a winery in early October is that harvest is in full swing. The winery staff were not picking grapes on the day of our visit. 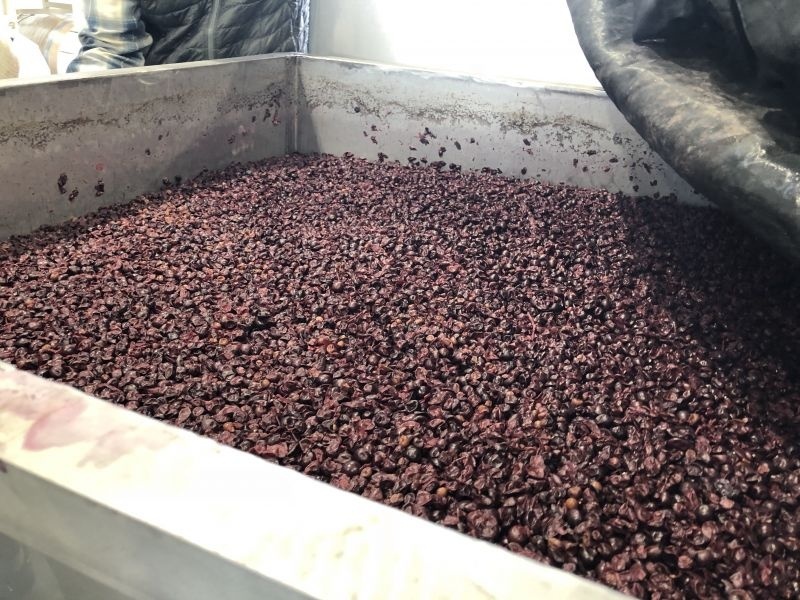 However, we did see tanks full of grapes at various stages of fermentation. Aromas of ripe fruit joined the normal oak aromas of the barrel room. 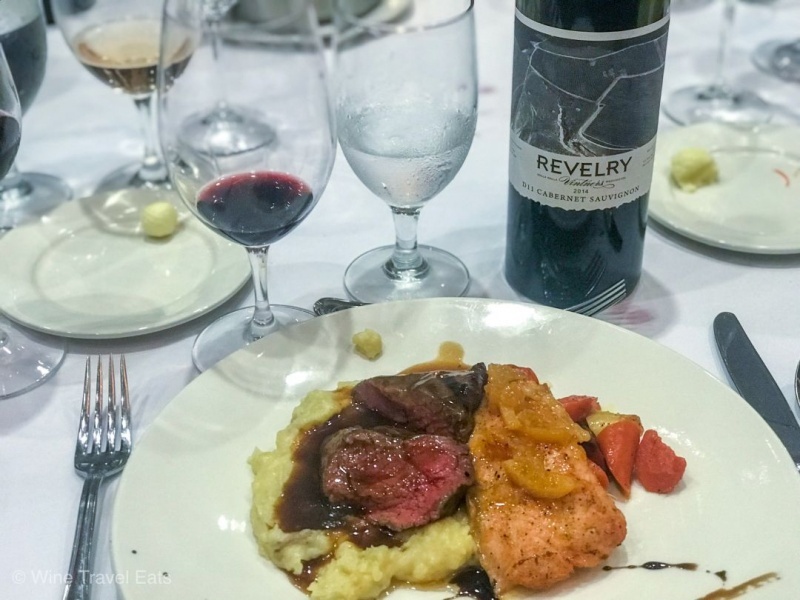 Revelry wines fall into three categories: Aerials Series, Range, and Columbia Valley Selection. The Aerials Series are their flagship wines. 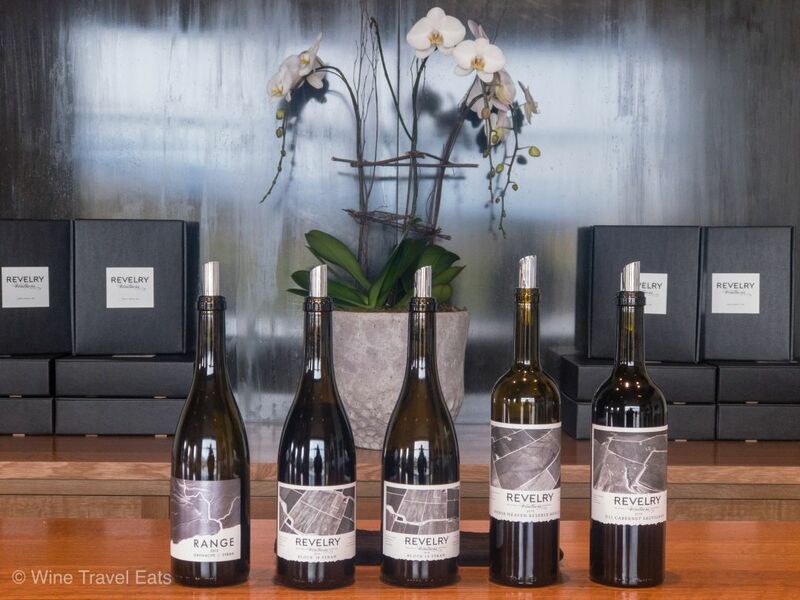 Each of these seven wines is made from a single clone of a specific grape grown in a single vineyard. Three of the series are even more specific, being from a single block in the vineyard. The vineyards are all within a two-hour drive of the winery. The labels on each bottle are an aerial photograph of the source vineyard. All but one of the wines we tasted came from this range. Range is a single wine. At first glance, that seems to make for an odd choice of name. However, the wine is a blend of Grenache from the Southern edge of Washington State and Syrah grown 100 miles further North. 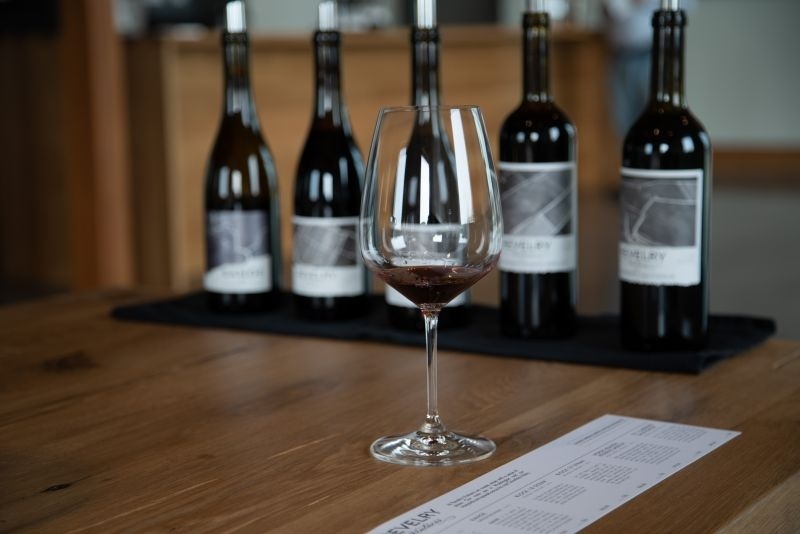 The Columbia Valley selection consists of six wines. Revelry Vintners first vintage in 2005 consisted of three of these wines. There is a rosé (Cabernet Franc/Grenache), Chardonnay, Merlot, Cabernet Sauvignon, and a couple of Bordeaux blends. I did not have an opportunity to taste any of these wines. We started our tasting with the Range Grenache/Syrah (67/33); aged twenty months in 100% neutral French Oak. It sells for $40 a bottle. The nose was spicy, with red fruit and leather notes. The mouthfeel is almost buttery in its softness. That texture is balanced by restrained acidity, subtle tannins, and a flavour profile that offers raspberry, blackberry, and pepper. The grapes grew in vineyards far apart but they exist in delicious harmony in this wine. Jared poured the next two wines side by side for comparison purposes. The Block 18 Syrah is a clone from the Northern Rhône. The Block 19 is a Southern Rhône clone of the same grape. As the numbers imply, the grapes for these two wines grow close together, with just a path separating the two blocks at Weinbau Vineyard. 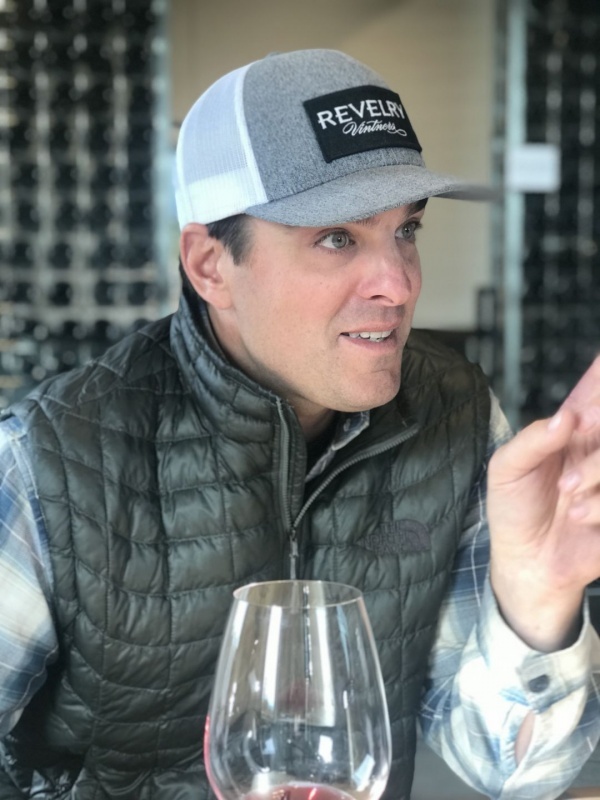 The differences we tasted are not just due to the clones, as Jared creates them using different approaches and the wines had two distinct vintages. The 2015 Block 18 Syrah ($56) was aged in 29% new French barrels and used 30% whole clusters. The nose offered red fruit, leather, and some floral notes. Plum and reducrrant flavours supported medium acidity. This wine offers good complexity, whilst remaining approachable. The 2014 Block 19 Syrah ($56) was aged in 20% New French barrels. The aromas were intense and fruity, with raspberry and other berries. The wine has a bright flavour profile with raspberry and black tannins. That combination made a fine example of the varietal. Amber and I both agreed that we preferred the Block 19 Syrah (Clone 877) to the Block 18 Syrah (Clone 174). Our next wine was 2015 Horse Heaven Merlot ($42); a vineyard near Canoe Ridge. The intense nose was rich and complex with plum and spice offering great promise. The mouthfeel was soft, yet with a delightful sharp acidity. Furthermore, luxuriant fruit expressed itself as plum and raspberry. The tannins were firm and somewhat to the fore. Amber observed that this wine needed more time. Jared proved her right by pulling a bottle of the 2011 Horse Heaven Merlot. The nose was wonderful; with waves of ripe plum aromas wafting from the glass with alluring spice in the background. The mouthfeel was as soft as silk, with tannins just as smooth. Pepper and plum lead to a finish that seemed to last for ever. Since the 2011 library wine was not for sale, we purchased a bottle of the 2015 and shall keep it for at least four years. Our favorite sip of the tasting – D11 Cabernet Sauvignon. The last wine was the D11 Cabernet Sauvignon ($80). The name reflects that the grapes come from vines planted in 1988 in Block 11 of the Dionysus vineyard. 45% aged in new French barrels. The Cab offered a rich nose of intense plum. The wine is opulent with plum, raspberry, and dust. A fine example of Washington Cab and another bottle that we purchased. The tasting room offers a classy environment in which to taste and the wines are exceptional. 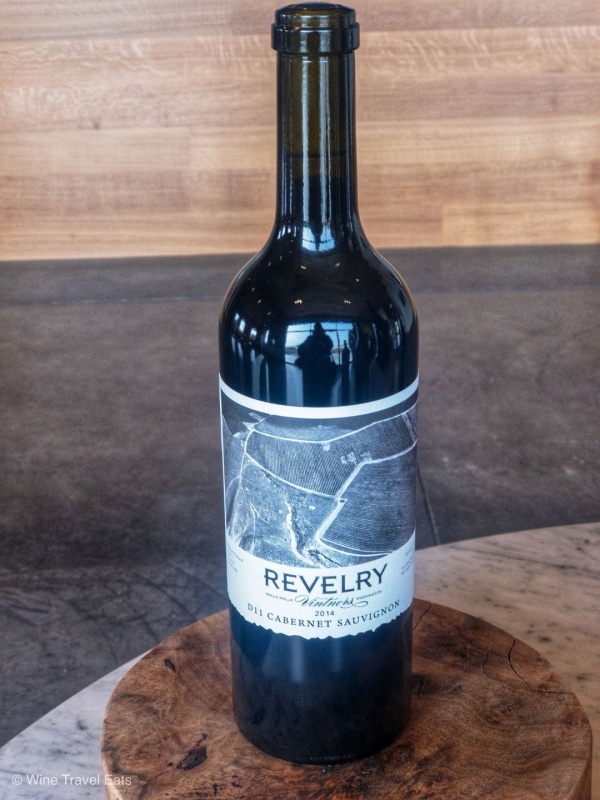 I recommend that you put Revelry Vintners on your list to visit when in Walla Walla. Even if you cannot get to Washington state, the wines, Merlot and Cab particularly, are worth ordering online. I am woefully under-exposed to Washington state wines. Thanks for sharing Revelry Vintners. Glad you had such a great experience with Revelry. They are a class act and a superb value wine.